I've been meaning to share these images of Chip and I from NOLA taken by my friend Aviva Bowman. She met Chip and I for breakfast in the French Quarter and drove us to the Garden District where we toured the Lafayette Cemetary together. Chip and I continued our walkabout sneaking peeks of the lavish homes including the home of author Anne Rice. I loved NOLA and can't wait to visit again. And if you are in the NOLA area or planning a trip there, give Aviva a shout for a family session or romantic couple session. NOLA is the perfect backdrop! Above photo taken on Thanksgiving Day 2012 | Tate making corn souffle. Chip | I am so blessed with an amazing husband. He is my soul mate, best friend & love of my life. He is patient and supportive. He values my opinion and we have great conversations. We don't always agree, but that's what I love the most. We can disagree and still love one another for we respect each other. Thank you Chip for always supporting me and loving me. My Children | I am so thankful for my four children... Roan, Tate, Connor and Carys. Chip and I both are thankful for our healthy, charismatic, loving and talented children. Each have their own little personality and each provide me with much inspiration, many belly laughs and lots of love. Thank you God for blessing me with these children for they enrich my soul. Parents | My mother is and has been an amazing mother and caregiver. She raised my brother JJ who is severely disabled and myself by herself. She continues to care for my little brother despite her age and her recent stroke. She taught me the most valuable lesson of all... family comes first. I'm blessed with an amazing father who always sees the glass as half full and has taught me to dream big and live life with intent. And, I'm blessed with a wonderful step-mother who has loved me since I was a toddler. She endured what no mother should ever live through when she lost my step-brother at age fifteen. Though her exterior may seem rock hard, she has one of the sweetest and most delicate souls. She lives to make my father happy and everyone else around her. JJ | My little brother. Though he is imperfect and broken in many ways, he has been my greatest inspiration. He loves unconditionally. He has the sweetest and purest smiles. He loves to patty-cake over and over and though that might seem really mundane to you, trust me... it is a huge achievement for JJ. The doctors said he would never sit up, never hold a bottle, along with many other nevers; but he can do many things and one of his favorite things to do is to put his hands together and clap clap clap to patty-cake patty-cake. Though he has no verbal language, his body language is powerful. He tells you what he wants and needs and his big hugs are the very best. I love you JJ so much! Grandparents | I was truly blessed with the BEST grandparents ever! MeMa and PaPa. MeMa is no longer with us but let me tell you... she was the empitomy of the greatest mother and grandmother. She was the sweetest, always loving and doting, and she was an amazing cook, seamtress, gardener, crafter and devoted christian. My grandfather who I refer to as PaPa has been my rock. He is an amazing man and I am so proud and fortunate to have him in my life. He's soon to be 95! During his life, he has lived through and seen many things like the depression and civil rights movements. He fought in the Army during WWII and is a Pearl Harbor survivor. He was gifted in many areas and one of his greathest strengths is his ability to storytell and to entertain. He is also a self-taught artist, pianist and woodworker. Friends | My friends are AMAZING. I know I use that word a lot and espcially in this post, but it is true. I have amazing people in my life and my friends are not an exception. Being the wife of an active duty Marine, we've moved many, many times and I've met some amazing people and many have become friends and a few have become my family. You know who you are and I love you for being in my life and loving me and my family. ART | I'm thankful for the talents that God has planted within me. I love to create and to be creative. I love to see through my viewfinder and capture life and freeze the moment. I love to dip my fingers into wet paint and feel the texture of my finger sliding across stretched canvas. I love to hear the charcoal scrape across the tooth of the paper. My art makes me happy and is vital to who I am and how I live. Repurposed Furniture | I'm thankful for the love that I have to repurpose unwanted junk into something that is loved and treasured. I've collected unloved and unwanted pieces of furniture over the years and breathed new life into them. I've kept many pieces and sold a few. Seeing the transformation is the true gift. My Kitchen | We're in a new house with an amazing kitchen. In this kitchen, I want to create new recipes and try out old ones. I love sharing my passion for cooking with my children. I'm thankful that they too are interested. I remember cooking with MeMa when I was little girl standing on a stool for I was too short to reach the counter, and I remember her abundance of patience with me as a new cook. As she did with me, I want to hand down the passion and traditions of our family recipes to my children. Books | I love to read! I go through phases where I read a lot and then sometimes not at all but I'm into another book and I love what it does for me. A great book a really, really great book transpires you to another place, another time and for a moment you've escaped reality. 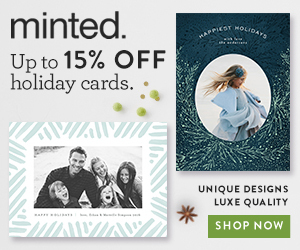 Black Friday deal at minted.com! Good news... I have a BLACK FRIDAY deal for you to use!